Battling at night is great fun, but finding your arrows in the dark can be challenging. With these Brown Glow-in-the-Dark LARP Arrows, you will be able to see wherever your ammo landed after a scouting mission or torchlight tourney. The rounded tip of the arrow is crafted from closed cell foam. The arrowhead features an inner rubber stopper for improved safety. The fiberglass shaft is highly flexible, shatterproof, and provides maximum accuracy. These arrows can be used on bows with a maximum draw weight and draw length of 30 pounds at 28 inches. They are capable of shooting up to 150 feet. The glow-in-the-dark fletching makes them easy to spot and retrieve after firing. 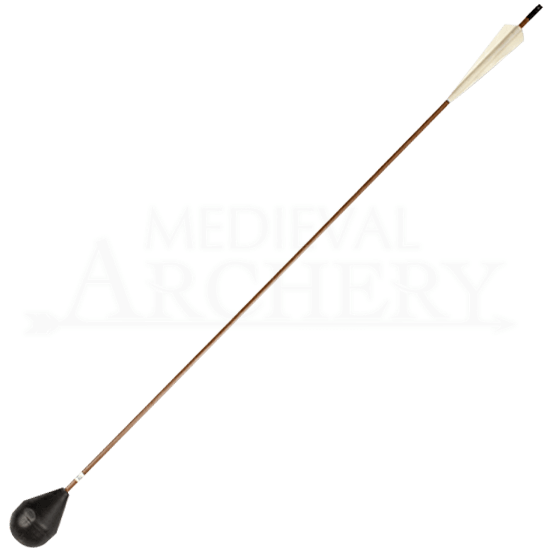 You will enjoy picking off the enemy under the cover of darkness with the Brown Glow-in-the-Dark LARP Arrows! Each arrow is sold individually. Check with your local organization for approval use.